There are a few simple accessories that greatly facilitate focusing with vintage cameras. A magnifier is an extremely helpful accessory for determining optimum focus on the ground glass. Many photographers use a standard hand-held loupe for this purpose. However, for those cameras with handy pop-up viewing screen hoods, inserting a loupe into the hood on a 4×5 camera is challenging, and with a 2×3 format camera, using a loupe of the usual size is virtually impossible. 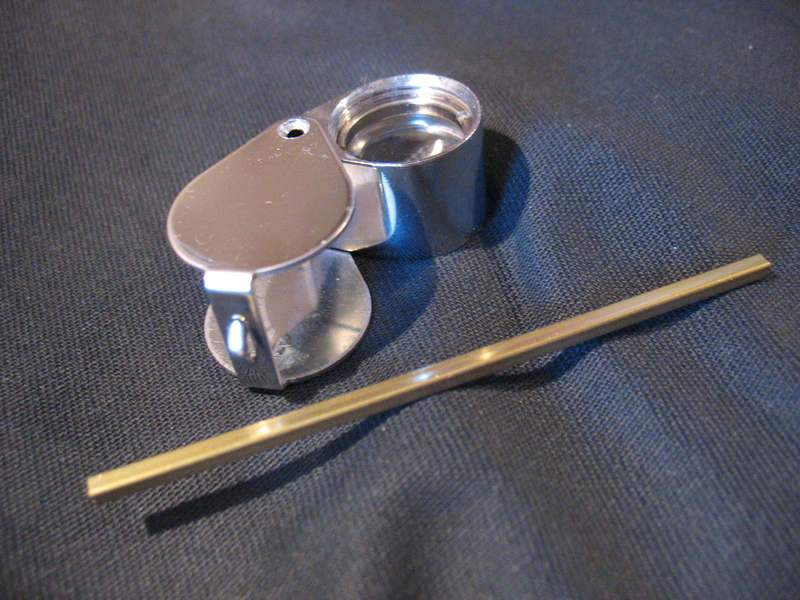 A simple magnifier on a handle can be easily fabricated from an inexpensive pocket magnifier and a short piece of brass or aluminum square tubular rod. Simple pocket magnifiers of the type shown are available in various quality levels on eBay or in hardware stores. Mine was purchased for $2.99 at Hardwick’s Hardware in Seattle. 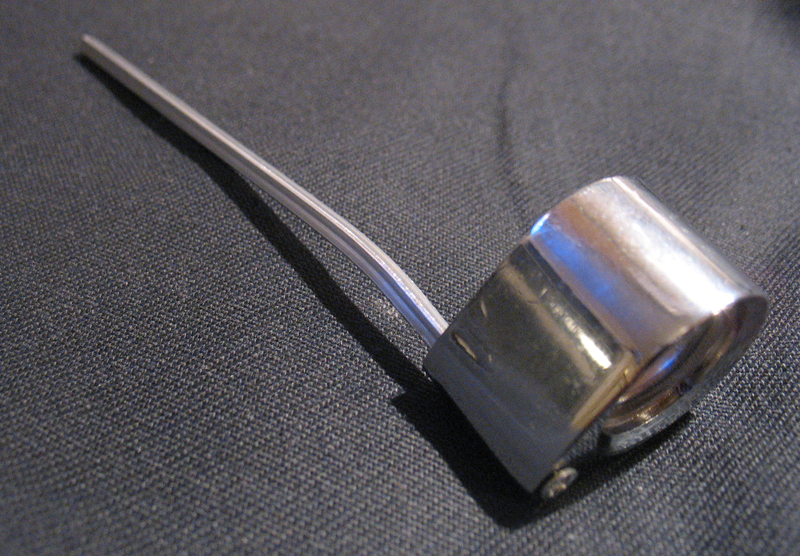 The rod or bar stock is usually available in hobby shops or hardware outlets. Undo the two screws holding the cover onto the lens assembly and remove the short rod that serves as a pivot, then replace it with an approximately 4″ length of the rod. 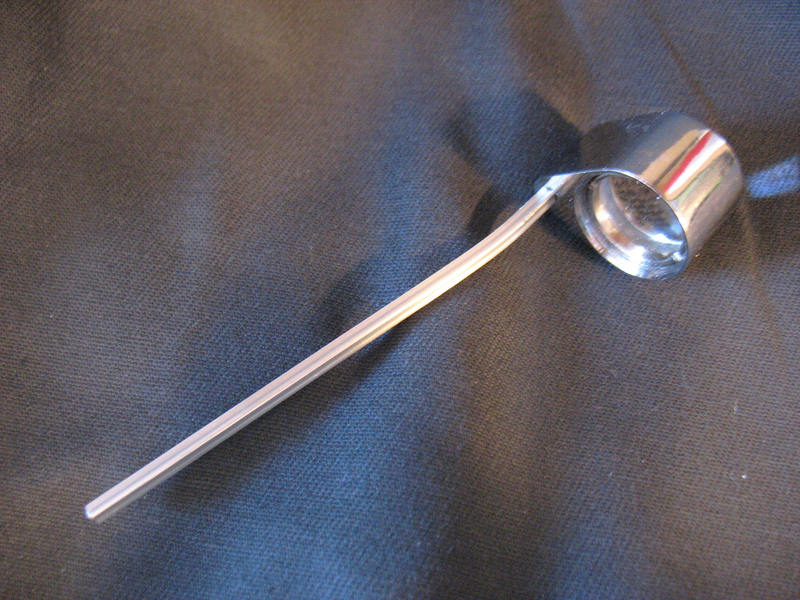 With my magnifier, 3/32″ square tubular rod proved to provide a snug fit. A small machine screw can then be screwed into the bottom of the rod to secure the lower end in the magnifier body (fortuitously, the small screws holding the magnifier together proved to be an exact fit in my case) and gentle crimping may be all that is required to tighten the fit of the handle into the magnifier. A gentle bend to the handle ensures that your fingers will be out of the line of sight. Precise focusing can then be accomplished by using the handle to position the magnifier into the viewing hood directly over the focusing screen. In the Pacific Northwest, the best weather for photographing the forests and mountains with their hanging moss and curtains of mist is usually overcast and rainy. Consequently, light levels can be very low. Even though the Baby Pacemaker, like many other technical and press style cameras, has a pop-up viewing hood, it is still hard to see the image on my non-Fresnel viewing screen. Consequently, having a dark cloth to put over the camera is very helpful and, under some conditions, essential. However, keeping a dark cloth in place over a small camera without having it fall off into the mud or slide over the lens can be a challenge. Consequently. I devised a dark cloth that can be snugged around the camera body. This is made from a 24″x40″ piece of heavy black cloth hemmed around the edges, with a nylon drawstring threaded through one long side. 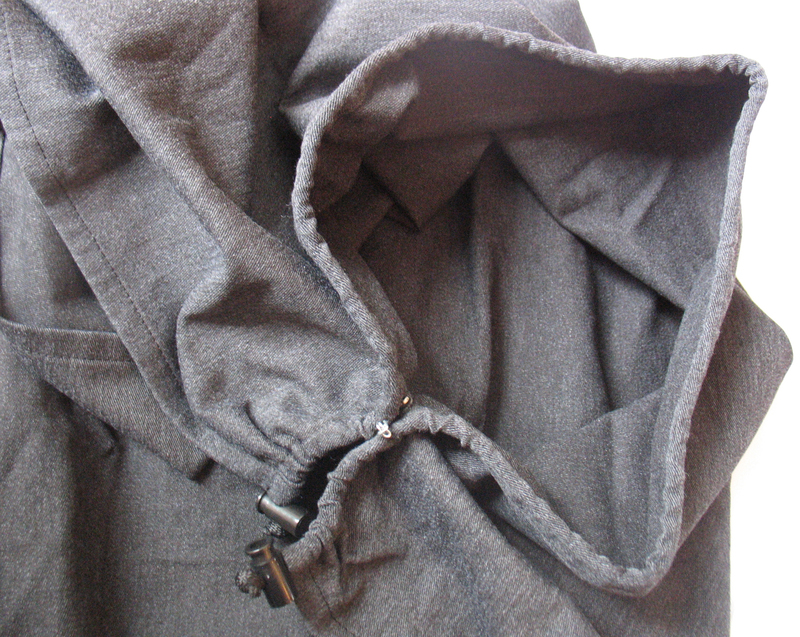 The cloth is then folded in half and clipped together by a hook and eye, leaving an opening just large enough to pass over the body of the camera. 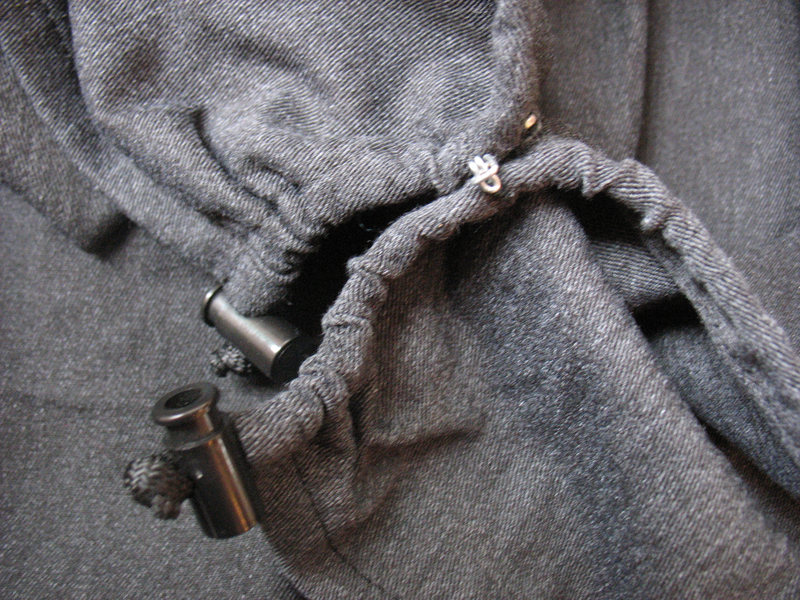 A cable clamp (available from most outdoor equipment stores) is threaded over each end of the cord, and these two ties are used to snug the dark cloth over the camera body. This entry was posted in Accessories by randcollins. Bookmark the permalink.